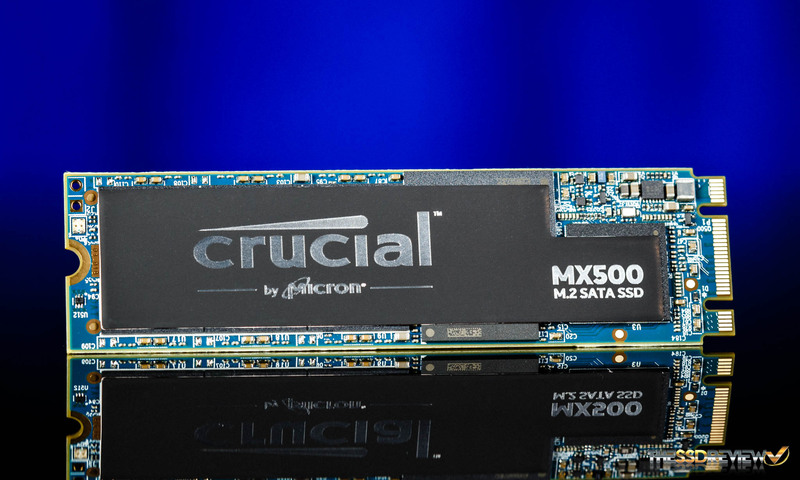 In December of 2017, we got to take a look at Crucial’s latest SATA SSD, the MX500. With a superb mix of performance, features, accessories, price, and warranty the MX500 earned our Top Value award with ease. There really wasn’t anything holding it back except for maybe one thing, availability. At the time of writing, only the 1TB 2.5″ form factor model was available. It wasn’t until the following weeks that we started to see the other capacities in the market and even then, the M.2 model still wasn’t out. Originally marked for Q1 release, the MX500 M.2 model still hadn’t shown up anywhere…until now. It is Q2 of 2018 and we finally have the M.2 version of the MX500 in our hands. It has been a long wait, especially for some of our readers who have been asking us for updates on availability. At least now we can say the time for waiting is over, the time for buying is now. Just like its 2.5″ brother, the MX500 M.2 model does not disappoint. Read on to learn more about the MX500 and see how the new form factor performs. The Crucial MX500 is a SATA 6Gb/s SSD that is available in both 2.5″ 7mm and M.2 2280 single and double-sided form factors depending on the capacity. 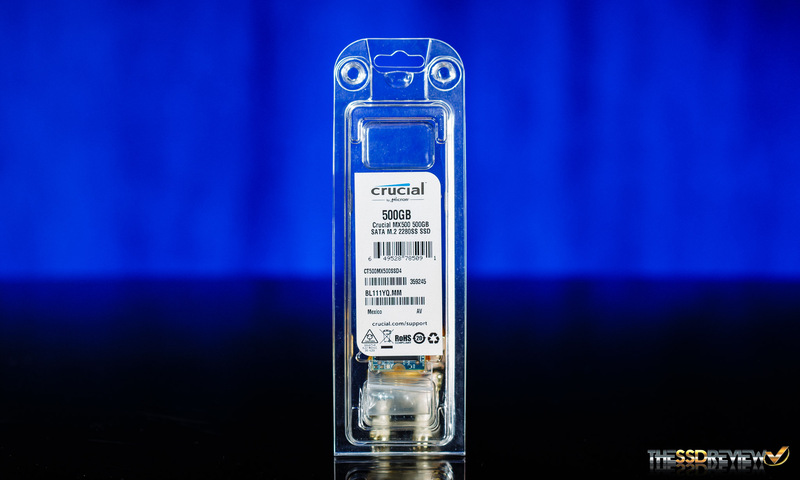 Our 500GB M.2 sample for today’s review is single sided. The M.2 MX500 is currently available in capacities of 250GB ($72.27), 500GB ($119.39), and 1TB ($229.99). There is a 2TB MX500 ($484.08), but it is only available in a 2.5″ form factor. 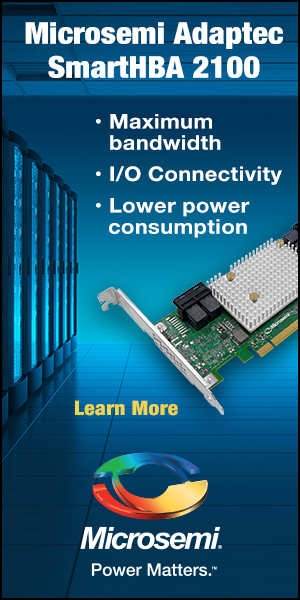 Sequential performance is rated at up to 560MB/s for read and 510MB/s for write and random performance is rated for up to 95K/90K IOPS read/write across all capacities. Endurance figures are based on capacity. The 250GB model is rated for up to 100TB, the 500GB model for up to 180TB, the 1TB model for up to 360TB, and the 2TB model for up to 700TB. In addition to this, the MX500 boasts a 5yr warranty, two years longer than the previous MX300. If you thought that was enough, wait until you hear the features list. Features such as SMART, DevSleep, TRIM, static and dynamic wear leveling, hotplug support, adaptive thermal monitoring, and secure erase are standard. 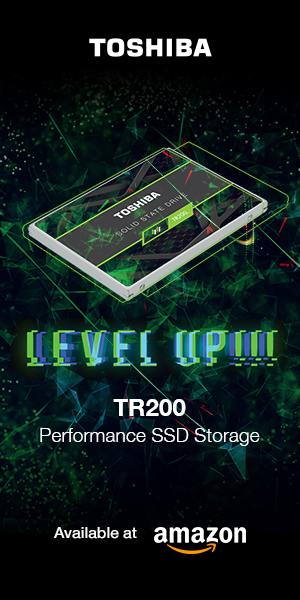 But, like many enterprise-class SSDs and unlike many consumer SSDs, the Crucial MX500 has a hardware-based AES-256 encryption engine that enables the MX500 to be TCG/Opal 2.0 self-encrypting drive (SED) compliant and Microsoft eDrive compatible. Additionally, RAIN (Redundant Array of Independent NAND) and Exclusive Data Defense provide parity protection and error protection for your data. 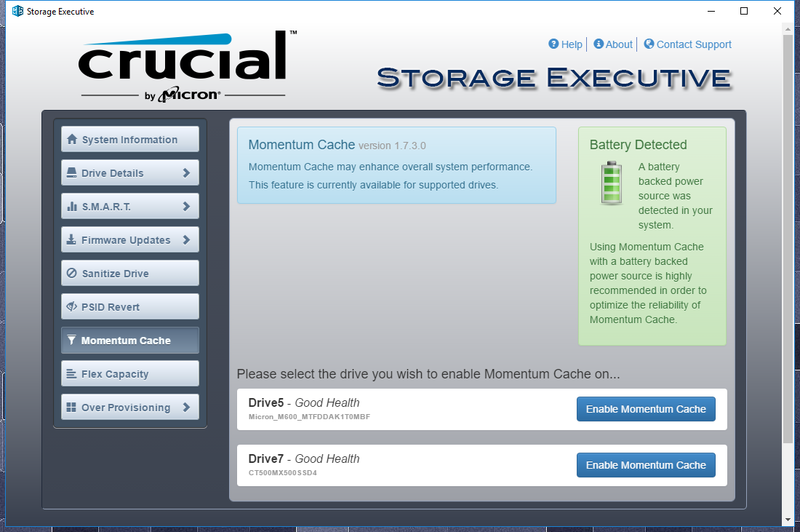 Also, Crucial has programmed in their dynamic write acceleration to enhance write performance. Finally, instead of utilizing a bank of capacitors for power loss protection, the MX500 has it built right into the NAND and firmware code. With this, capacitors are no longer needed to provide the extra protection and thus, it helps to keep the cost down for us, the consumers. With a feature list like that, there is little left to add, except for maybe an SSD Toolbox, which is also included. With the purchase of the MX500, you also get support for Crucial Storage Executive (an SSD Toolbox) and Acronis True Image, a cloning software that allows you to migrate your current OS onto your new MX500 or you can simply use the software for backup. The MX500 M.2 model comes in a small, clear clamshell package that can be hung on a display in a brick and mortar store. On the frontside is a sticker with the basics such as what drive it is, the capacity, and compliances and SKU’s. On the backside is nothing, but we do get a preview of the MX500. 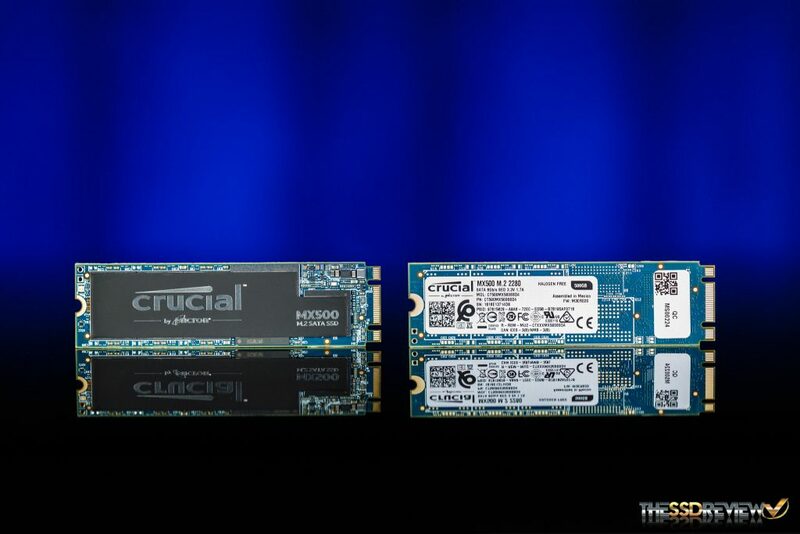 In addition to the MX500 SSD, Crucial includes two mounting screws and a leaflet with download instructions for Acronis True Image as well. Taking a closer look at the drive we can see that Crucial has opted to not only create a very stylish frontside sticker, but they have also made it out of a thin metal and it could act like a heat spreader, similar to what we have seen in the past from Samsung. Whether or not it works well, we will see in our testing later on. On the back are just some stickers. Since we have already disassembled the 2.5″ model in the past, we opted to not take the sticker/heat spreader off of our M.2 sample for close up photos of the controller and NAND. The MX500 is powered by an SMI SM2258 SATA controller, this is a very popular controller and it is more than capable of delivering great performance. Although, this is only one part of the mix, the other is the NAND. 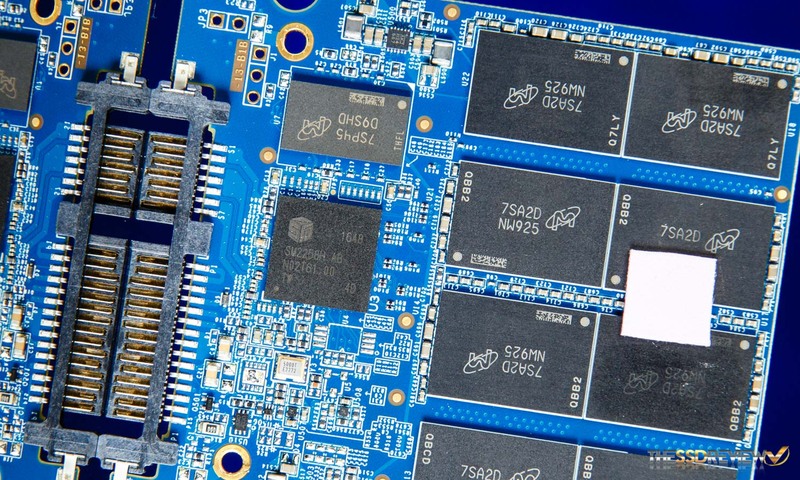 The MX500 has some of Crucial’s latest 64-layer 3D TLC NAND and after reviewing the 1TB 2.5″ MX500 with it, we can confidently say it is a great improvement from their last gen stuff. Our 500GB sample has 4 NAND packages, in contrast to the 16 our 1TB sample had in it, and once formatted the end user has ~465GB of capacity in Windows.